Press the "Play" button to automatically walkthrough the campus. Use the arrows keys to navigate in the building. Move your phone to view 360 OR on desktop, click and hold your mouse on the tour window to move around. Click the numbers on the right to go to other floors in the school. 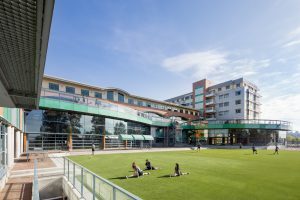 Bodwell's modern campus features include; two multipurpose gyms, indoor swimming pool, theatre, state-of-the-art multimedia auditorium, music rooms, split-level library, and two spacious cafeterias, both with rooftop patios. 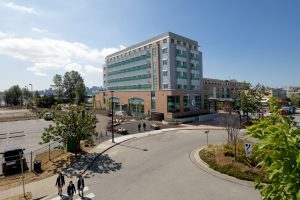 The entire school is covered with high-speed wireless internet allowing for freedom of movement and access to information anywhere on campus. 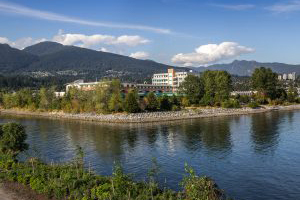 Our on-site boarding program provides rooms with a view of the waterfront or the breathtaking North Shore Mountains. 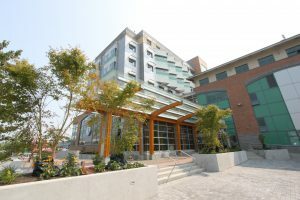 Boarding halls are monitored and staffed with professional boarding advisors that oversee student activities and safety. Male and female students live in separate boarding halls. Are you in Vancouver and are interested in taking a tour? The admissions staff is available by appointment depending on availability, Monday through Friday, 9:00 am until 4:00 pm to give school tours and answer questions in person. Please note, the current virtual tour above shows Bodwell facilities at the end of 2014. We will update the tour once the new 7-storey east wing facilities are completed by Fall 2017. 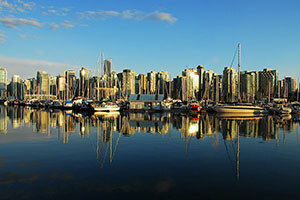 Vancouver is known for its beauty and modern, high standard of life. The Economist magazine has consistently ranked Vancouver in top spots in its annual "Best City in the World to Live in" survey. Bodwell students have the opportunity to visit world-class museums and art galleries, tour exceptional Canadian universities, and experience the ski slopes that hosted the 2010 Winter Olympics – all within a short distance. Boasting a rich Aboriginal heritage, Vancouver is now home to people from all over the world. Vancouver is a city of beautiful trees. The city holds thousands of acres of regional park spaces that feature lush forests and diverse wildlife. Stanley Park, the crown jewel of Vancouver, is a must-see, with its towering trees, picturesque seawall path, and diverse recreational choices. From the Pacific Ocean, to surrounding rivers, streams, lakes, and of course rain, Vancouver is surrounded by water. The fall and winter rains ensure greenery through warm summers and provide a refresh for the city's streets. 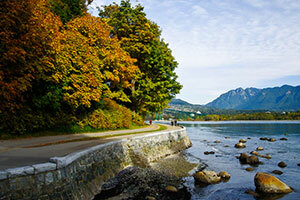 The Vancouver Coast is crowded with sea life and provide a wealth of professional and recreational possibilities. 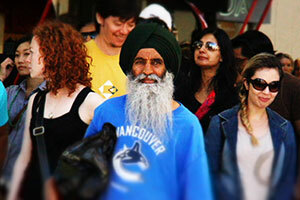 Vancouver has attracted people of all nationalities for decades. The mix of people has resulted in a tolerant, friendly culture, rich in history and diversity. The markets and restaurants in the city are truly a reflection of the city's population, where you can sample foods and products from all over the world. From the airport (YVR) click here. From Vancouver Waterfront Station (via Seabus) click here. From USA - Douglas Border Crossing click here. From USA - Peace Arch Crossing click here.